This article will go over a few of the more popular brake upgrade options starting with the most simple and lowest cost. 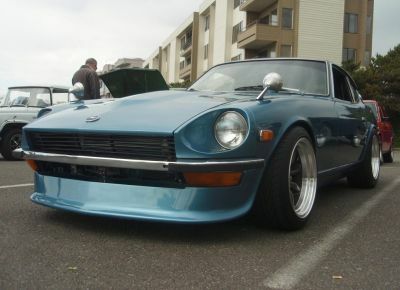 There are a few big-brake options for the front and rear of your 240Z or 280Z. For any application, the early production 260Z will match the 240Z parts and the later production of the 260Z matches the 280Z. If you are a 260Z owner, you need to figure out where your car falls in this line or just switch all your suspension out for the more heavy duty 280Z parts. The first generation of Z-car has small disc brakes in front and drum brakes in the rear. For many road and track conditions, these brakes are adequate. 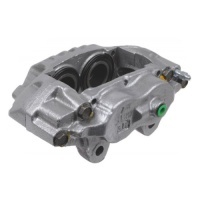 Toyota made a 4 piston brake caliper that has the same mounting points as the 240Z caliper. It bolts right on to the Z-car spindle and is centered correctly over the stock brake rotor. All you have to do is trim away some of the backing plate (dust shield) to allow the larger caliper some clearance. You may also remove the entire backing plate if you wish. Carefully bend the brake lines a little and they will connect to the Toyota caliper. Be careful when bending the brake line to make sure you do not kink the line. The Toyota 4x4 truck (1979-85) and 4runner (1984-85) has the correct 4-piston calipers. Those trucks had solid front rotors just like the 240Z so they are only wide enough to fit over the factory solid rotor on a 240Z or 280Z. ​With this upgrade you approximately double the surface area of the brake pads. Optionally, you can increase the diameter of your brake master cylinder by installing a 1979-81 280ZX brake master. This will flow more fluid with every inch of brake pedal travel. (firms up the pedal feel) The brake master upgrade is not required but is recommended for all of these brake caliper upgrades. 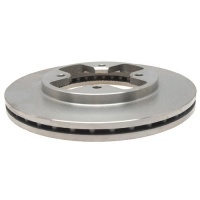 Toyota 4x4 trucks in later years had thicker rotors that were vented for added cooling. The calipers were nearly the same but were made wider to fit over the thick vented rotors. The calipers for this conversion are found on Toyota 4x4 truck (1988-95) and 4runner (1988-91). Those trucks had vented front rotors similar to the 300ZX (Z31). They will bolt to the Z-car's spindle and fit nicely over the 300ZX rotors. ​With this upgrade you not only get larger calipers and brake pads but you dramatically increase the cooling effects of the rotors to keep the rotors from warping under hard braking. When bolted to a 280Z spindle, these wide Toyota cailpers are not perfectly centered over a 300ZX rotor. Because the caliper is fixed and not a floating type, you need the rotor to be perfectly centered for proper braking response. There are a couple places that you can buy spacer rings made in the correct thickness for this exact brake conversion. Slip the rings over your four mounting bolts and bolt the rotor with rings right to the 280Z hub. Now the rotor is centered correctly. ​When ordering spacer rings be very careful to specify if you will be using these on 240Z hubs or 280Z hubs. The set of spacers will have slightly different thickness depending on the application.